“Tanghi Argentini” – A portly office employee gets some help with his Tango skills from a co-worker to impress a blind online-date. Cute, humorous, mostly dialogue-free, but just one hair to close to a graduate student film for me. “At Night” – Powerful and incredibly acted Danish film about three young women in a cancer ward, spending New Year’s Eve together and reflecting off each other their different situations — one girl is new, one girl is terminal, one girl is in the middle, and all of them, at different times, want to live and want to die. The performances were as good as any by a female I saw last year, and the direction and cinematography were superb. It’s about 40 minutes long. “The Substitute” – Charming and much, much, much shorter film about a substitute teacher who comes into an Italian classroom and goofs off the with kids, alternating between intimidation and complete playfulness. I won’t ruin the perfect second-half of this film, which begins when the sub jumps out the classroom window to avoid the school administration, but it’s all about being a kid vs. being an adult, and feeling like you’re a kid in an adult’s shoes. Great little film, total crowdpleaser, and my favorite of the live action shorts. “The Tonto Woman” – Another longer short film set in the American West, about a somewhat mysterious man who comes across a woman exiled by her husband to live in solitude after being enslaved and marked (with tattoos on her chin) by a group of Indians. He is intrigued by her and, given that in the first scene this man confesses to having bedded over 200 women, we presume he views her at least initially as another sexual conquest. As he spends more time with her he decides to protect her and confront her husband with their relationship. The tone, great score, and cinematography all reminded me of PTA and of course, THERE WILL BE BLOOD, and I’m sure this filmmaker is a fan (there’s even a MAGNOLIA esque intertitle). All in all an impressive and really almost dreamlike mini-film. “The Mozart of Pickpockets” – Another crowdpleaser, this time with a cute little boy who’s supposedly deaf and mute who latches on to a pair of adult thieves. This has a kind-of dark horse appeal to it, but frankly the emotional power of the previous three films was still washing over me and I was hardly paying attention to this one. I am 95% positive that Oscar voters will be deciding between “The Substitute” and “At Night” — the Danish film being the more “important” film, but after seeing “The Substitute” it would be almost impossible not to vote for it, and I’m banking on it personally. “Even Pigeons Go to Heaven” – Playful computer animated short about an elderly man (a bit much of a knock-off of Pixar’s Geri) who is sold a pod-to-heaven by a scheming businessman. Mostly just kinda cute and inconsequential, a little film-schooly, but some of the animation, like when the businessman’s car bounces through a forest road, is sublime and mistakable for stop-motion. “My Love” – Imagine the paintings of Renoir come to life… This Russian story of a young man in love has the logic and aesthetic of a dream, where character morph and transform into fantasies of themselves within just a few frames. The whole thing has the weight of air, as if we’re blowing through the subconscious of the characters. Really unlike anything I’ve ever seen. “Madame Tutli Putli” – Amazing and essential stop-motion mini-film about an intriguing woman who boards a night train that slowly becomes more and more nightmarish. Just one look at a still from this film shows you just how inventive the sculpting and character design is here; in Madame’s wonderfully-animated eyes we see real life. The film gets more dreamlike as it goes along… seemingly a metaphor for death and rebirth. masterpiece. I hope this impressive and seminal work is embraced by an audience, released on DVD or shown on television for today’s children. 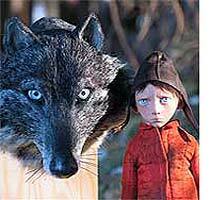 …surely Peter and the Wolf. But like I said, the others definitely have their charms and strengths, and the other stop-motion, Tulti-Pulti, is just about as impressive formally. But if there’s justice in the world, I can’t see Peter and the Wolf not getting recognized here for its incredible achievement.